Rated 5 out of 5 by SilverBranch from Still so unique! These Azada games just get better and better. This second installment is better than the first, yet still highly unique and challenging without crossing the line into frustrating. I was entertained through the whole game. Rated 5 out of 5 by susanwhittaker from Works Your Brain! The previous reviewer criticized the mini games, but they're what makes the two Azadas both interesting and challenging. If the games' creators told you how to solve the puzzles, what would be the point in playing the game? Not only did I finish both games, but my 11-year-old daughter and I had a blast seeing which one of us would reach the end first! Rated 5 out of 5 by Lolyta_IceWalker from Stunning and entertaining As an avid reader, I loved this part even more than its predecessor, 'Azada'. No longer is each section between story a series on unconnected puzzles - in Ancient Magic you delve into well-known stories to help familiar characters solve problems. A mix of the non-conventional HO scenes from part one along with both logical, object-based problems and simple puzzles, there's plenty of variety here to keep you interested. As a quick puzzler, however, I got about half-way through in the one-hour trial. Nonetheless, a worthwhile buy, I thought, despite the shortness. Very, very entertaining. Overall, fine graphics, unintrusive music #I kept it low, but listened to it somewhat#, cute mini-stories and an absorbing story arc. Reccomended. Rated 5 out of 5 by ladyofnight from Great game for adventure experts! Azada: Ancient Magic lured me into the adventure games genre.The puzzles are challenging and require skill and patience, probably not for beginners. If you frustrate easily, you may not enjoy the Azada games but this is definitely one of my personal favorites. I was thrilled to find puzzles that were intellectually stimulating versus mindlessly clicking my way through. Took many hours to beat, great value. Rated 4 out of 5 by MeganB7 from A good game with a few drawbacks If you like puzzles, Azada is a good game to get into. You have to work your way through a number of classic books, working out what needs to be done on each page in order to finish the story. Each book has a small number of pages, and you can flip back and forth through the pages to find items or solve puzzles. The puzzles are rather challenging, but you can earn 'orbs' that let you skip a puzzle. If you're stuck on what to do, you can click for help though you lose time for each help you accept. One bonus of that system is that you can click to see if you'll be offered help or you'll be told to go to the other pages first. One of the main drawbacks is that the writing in the dialogue/instruction boxes is small and hard to read unless you've got good eyesight. Anyone with less than good eyesight will end up peering at the screen and trying to work out what the heck it says. Another drawback is that you have to click 'ok' to close the dialogue box to continue. That gets annoying when you're trying to work out what to do and the dialogue box keeps on appearing. Aside from those drawbacks, it is a good game with a number of puzzles included, so if you like puzzles, this one might suit you. Rated 4 out of 5 by BellaMorte from Enjoyable After having played the first Azada, I had to play this one. The graphics were good, as was the game play. This is not an overly difficult game to play, even though the odd mini game or two could be a challenge. Rated 4 out of 5 by rheashard2 from Azada again I enjoyed this game. It wasn't quite as good as the first but excellent all the same. The puzzles were a little bit too easy to figure out. I liked the reset feature to go back to the start of each 'chapter' quickly when I wanted a do over. The graphics were good. The mini puzzles needed between the larger segments needed variety. Once this puzzle was figured out it was boring to have to repeat it. I am curious about #3. Rated 4 out of 5 by 1Fishy from Ancient Magic Returning to Azada, we again get the beautiful graphics. I play with the sound off mostly, so I'm not a key contributor for assessing these. The bit I listened to was decent. Like the first, this game is filled with many books in which we are helping right the troubles the characters have endured. We need to, in essence, be a Sherlock Holmes and discover "whodunnit"! The games are fun and generally quite easy to solve. I did have trouble with the "Secret Garden". I could not solve it. I looked at the cheat and discovered there was a glitch in the game. I restarted that book and it all went well. (glitch: The apple that was supposed to be there wasn't!) I enjoy these games as there is an absence of hidden objects. I enjoy the adventure/HOG games, but it's nice to have a slightly different genre to play. The games/books are compartmentalized, so it is easy to leave the game and return to do the next book. I have found that I have become to like stories that link more together than these do. There is an "end game" but that is about as much as I found linked them together. It is nice to do tasks that are not "the same old, same old"! These are not the games usually seen on the HOG games. It was also a nice addition to have the "pages completed" on the right hand corner when they were done as sometimes, the littlest thing may have been missed by the otherwise keen eye. If it said you were done, you knew you could move on. If not, you may find yourself looking a little harder! The game is smooth and enjoyable. You can go at a timed pace, or just sit back and enjoy all of the features of the game. It was a great little treasure to play on a late night. Rated 4 out of 5 by debbie_candy from oddly original! On the really positive side is that the game developers knew all along from the era of Azada (the first game) that there'd be a new azada as well. So, the password given in Azada I is used for an extra chapter in Azada II, which kinda amazed me. Also nice was that the storyline included a lot of the world's most famous fairytales. Not that hard were the riddles and such. All in all, a pleasurable, but non-the-less short game. Rated 4 out of 5 by cbilbo from Great challenge This is the second installment in Azada. Not knowing that the original was a puzzle game, I found that I did enjoy it. With the Azada: Ancient Magic, you are continuing the adventure. You are back in the library, however this time, you are to try and fix the computer. With the help of the identiy cards, you are to do a series of puzzles. The storyline is good. Working with puzzles on classical books again. The puzzles seemed failry easy for me this time around. I would suggest this game to anyone. Rated 4 out of 5 by sudsysuzy from Another great puzzler More puzzles, plus I can ditch the timer. A bit different than the original Azada, but equally as enjoyable. The challenge level is higher than the original. More thinking required and planning out some of the solutions was absolutely necessary. Storyline is a bit weak but supported the book concept. Also a set-up for a sequel. Visuals were mostly superb, even to the point of finding writing pens without magnification. My only ding on visuals is the card evaluation section. Finding the symbols was difficult for my eyes and at some points became a guessing game. Another great puzzler. Rated 4 out of 5 by zoomzoomZombie from Good Puzzle Game Azada: Ancient Magic is a fun puzzle adventure game. 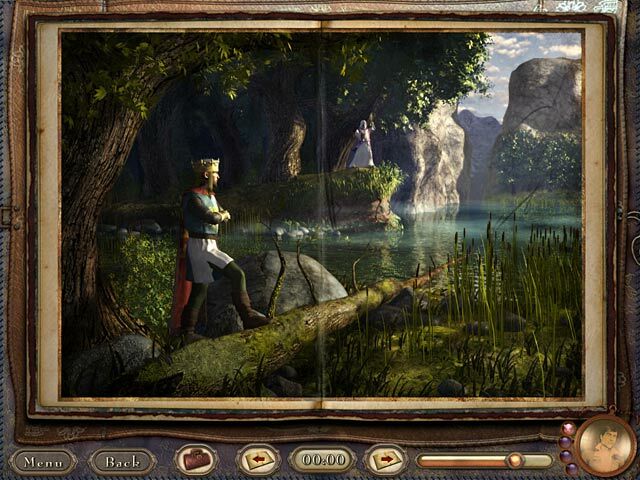 If you are looking for a game heavy on hidden object scenes, this game is not for you. The only hidden objects to be found are incidental to the plot, and not in specific scenes. The story line revolves around you helping Titus find the source of the evil magic in the books in his library. The books are snippets of classic fairy tales and novels. Each book has around four pages that require you to go back and forth between the pages until they are complete. I enjoyed the puzzles. Some of them were very easy. Some of the books only took me 2 1/2 minutes to complete the entire story. I liked the graphics and music very much. I didn't enjoy pressing 'OK' every time I was in a book to exit the dialog bubble. The game took me around three hours to complete, and I played in timed mode. 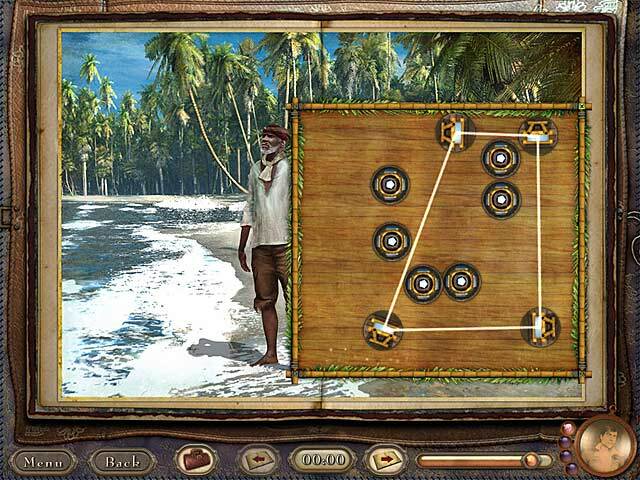 A good game for people who prefer puzzles to hidden objects in their adventure games. Rated 4 out of 5 by pses from Another fun Azada puzzle/adventure game! The Azada series of games are quite enjoyable. Nice graphics, fresh and original puzzles. 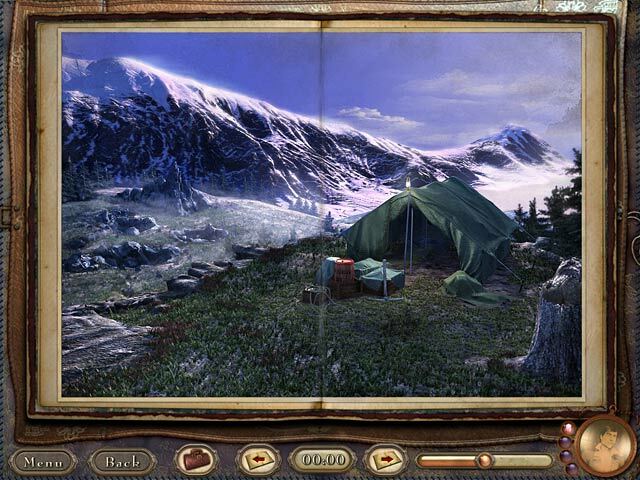 Hidden objects with an adventure story-line. If you enjoy this kind of genre, try the trial - you'll like it! Rated 3 out of 5 by robindrake29 from I won the game! It only took FOUR YEARS!! Quite a few people liked this game and its predecessor, simply titled "Azada." I liked the first one enough to pony up the cash to get this second one, but honestly I remember while buying it that I was mostly thinking, "At least it's different." A fairly quirky reason for choosing a game, considering how many I've purchased from Big Fish over the last few years. I know what I like in a game, and "different"... isn't really a strong recommendation. I was getting pretty tired of the repetitious "junk pile" Hidden Object games that were being premiered month after month at that time. Not much to distinguish one from another, and most of the Hidden Object scenes that I adored just seemed to be filled with leftovers from an end-of-the-galaxy hangar sale. By contrast, "Azada" and "Azada: Ancient Magic" contain no junk piles at all. In fact, they're the cleanest games I've ever seen, visually striking, with rich colors and true-to-life imagery that would be fascinating if the players ever got to tinker around with all that stuff. But we don't. That's probably my #2 reason for not liking this game as much as I hoped when I purchased it. The designers present carefully crafted, beautiful miniature worlds full of intricate, almost photo-realistic scenes, but in each one we typically get to handle almost nothing. Every kitchen's cabinet doors are strikingly rendered, but we never get to open them. Gardens are verdant with lush florals, but we not only don't get to stop and smell the roses, we don't even get to touch them (unless one is needed as part of a spell or something of the sort). Each page of each book that we explore in Titus' great-uncle's library is an amazing scene, but at most we get to click a few small (often VERY tiny) objects and put them into the inventory bag for use later on some other object or in another scene. We don't get to turn them around and admire their intricacies. Picking up an adjustable wrench? No, you won't get to turn the little wheel and make the wrench fit the bolt, or even turn the wrench to loosen or tighten the bolt. Hovering your pointer over the tool makes the action happen, often so fast that you don't really see anything but lots of those "Something Amazing Occurred!" sparkles and flashes to tell you that you've advanced the game. So if not being able to check out the merchandise is the #2 reason why this wasn't my favorite game, what's #1? It's the same reason that it took me four years almost to the day from buying this game before I finally finished it. It just plain IS NOT MUCH FUN. I play games as a diversion from the many not-fun parts of my life. I want the games I play to be an enjoyable use of my time and energy; I don't want to finish playing a game only because I have a stubborn streak that prevents me from abandoning an activity that I intended to enjoy (even if I'm clearly NOT enjoying it). "Azada" gave me a moderate level of satisfaction, from puzzles that were interesting and challenging to solve. "Azada: Ancient Magic" wasn't a torture chamber; I didn't hate the game enough to stop playing it completely. But I didn't like it enough to keep playing it regularly, either - even just to finish it. Instead, I played a book or two every couple of months over the last few years, until I finally got to the last book today. I even played the bonus book, and then I searched around in the game window to make sure that I hadn't forgotten to do anything. Now I can contentedly delete this C-level book from my computer and never bother playing another version of it again. If I'm in the mood for really nice graphics, the World Wide Web holds many sites of museums, artists, science fiction producers, and even a wonderful place called Big Fish Games with a burgeoning playlist of very entertaining time-occupiers. Even if most of them have an occasional junk pile or two. Meanwhile, do I recommend this game? Yes, if you don't mind meandering around wondering what to do next because you don't have any information, and you don't object to solving puzzles just because they're in the way of getting to the next "possibly fun?" thing to do. Otherwise, spend your money or your credits on something else. Rated 3 out of 5 by Mayzy from Mayzy's Review: Azada: Ancient Magic This is the second game of the Azada series, following 'Azada' itself. Though Azada's story was bare-bones, I really enjoyed it. I'm afraid Ancient Magic didn't live up to it's predecessor. The puzzles, already pretty easy, became downright simplistic. The control improved a bit and the art was maybe a mite better, but overall this game isn't worth a buy unless you're really eager to go through all the Azada games in sequence. Rated 3 out of 5 by LizzieK from Good puzzles I have played through the full game several times and replayed some of the mini-games even more. I’m glad I bought the game and it is worth playing. But overall it doesn’t seem to impress me as favorably as the original Azada. I didn’t have a problem with the timer at all. Mainly because if you time out on a segment of the game that has, for example, five books you don’t have to repeat all five books. You start over in the book where you left off. But I’m glad that everyone has a choice now. I thought the character’s dialogue type size was too small. The dialogue appears to be white and grey shaded print in a dark brown box. I found it to be fuzzy and difficult to read. I am one of the many intelligent and active older gamers whose eyesight is no longer perfect. I truly wish the game developers would let their parents and grandparents test their games. I wonder if you had testers that were in their fifties, sixties and seventies. Many of the things that I did not like about this game have to do with things being too small on the screen. In a few books you have to do something in one room like put water in the cooking pot, ring a door bell or knock on a door, then quickly go back to another room and do a task. This would be ok on a limited basis. But I think it happens too often and seems like a time filler to make the game seem longer. In general the logic of moving and solving the book puzzles is pretty easy. I enjoyed that aspect of the game but felt that some of the books were too short. Scanning the suspect cards every few books was a bit tedious. The puzzle was ok but the light blue and light purple symbols on the grey background was difficult to see. More color variance and larger symbols would have been nice. There was plenty of blank grey space on these puzzle pages so the symbols could have easily been made bigger. And we had to go to this game fairly often so I feel it would have been a more pleasant experience if there had been something there other than a blank grey grainy background. I liked the variety of the mini-games and I will enjoy replaying some of them. But some of the mini-games were in a small area of the screen rather that being made full screen as they were in the original Azada. I loved playing the Robots in Azada, but in this game the Tin Man game has very small objects and is in a small space. The glass tubes are hard to see in the Alchemy game where you blend the red, yellow and blue into the bottle. This is a pipes type game and I love pipes games but this one was a strain on my eyes. Also the Chicken Chase and the round Maze with the ball were very small on the screen. I didn’t enjoy tracing the signature of Dr. Jekyll. It’s just wasn’t fun and had no thinking or mental challenge. One can’t help compare this game to the original Azada. I had a happier and more fun filled experience in the original Azada. The mini-games were fun, they got progressively harder and they were full screen and easy to see. Also the visual mix of colors in the art and special effects throughout the original Azada was more pleasing. 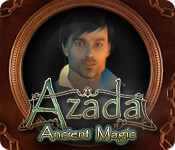 Azada Ancient Magic game gives me the impression that there are too may dark scenes with too much grey, dark brown and other dark colors. Overall I will say again that I am glad I bought the game. Rated 3 out of 5 by Frogglin from Great concept, let down by frustration The idea behind this game - entering the pages of books to help those inside - is excellent. The puzzles are not particularly difficult, although from time to time some extra thought is required. This also goes for the minigames. However, the interface is frustrating. Having to click "Ok" on random dialogue, popup hints etc etc slows the game down and becomes irritating over time. Overall though, a decent game and a good way to spend a rainy afternoon. Rated 2 out of 5 by JustTheFacts from Another Promising Game I Just Can’t Finish Based On Second Attempt To Complete Game I admit I’m not good at puzzles, but I’m not useless either. Yet, once again I am barred from playing this game because I have run out of skip and simply cannot solve the puzzle. The forums have long since stopped discussing Azada, and even what was there could not help. And of course, no walkthrough. I don’t understand why Felix insists on puzzles with no skip. I know they’re supposed to be a challenge, but frustration overcomes any sense of accomplishment when you simply cannot proceed. I’ll probably never play this or the first Azada again, and that is a shame... Because I was enjoying this game. The graphics, gameplay and story were all a big improvement on the original Azada. I love the idea of being trapped in a story and no way out. And there were clearly many stories in this game. Rated 2 out of 5 by jillyc from annoying Not much of a story line, no skip button and altogether one of the most annoying games I have played. Rated 2 out of 5 by grannieshirl from Azada: Ancient Magic The mini games are bad. Explanation do not tell you clearly what is to be done. Also don't seem to work right stops and goes. Making doing the mini game even harder. If this was solved it could be a much better game. As is I can not recommend it. Rated 1 out of 5 by j62janet from awful I thought because I liked Azada Elemental I would like this game, I could not have been more wrong, I didn't play it very long, as it just didn't impress me at all.